On behalf of the live events team, I would like to tell you all about an event that we ran last week dubbed Operation Spectre. Let‘s get into the background first. With the roadmap for Rubicon laid out, we thought it would be interesting to finally tackle something we have been thinking about since we started working on events – taking an in development feature and rolling it out with lore context and player involvement. The feature we settled on was Ghost Sites. This made sense as both CCP Affinity and CCP Abraxas were on the development team creating the feature, and the sites involved pirates--which gave us a chance to do something else that has been oft-requested of the events team – running an event in null sec. We had some other goals prior to deciding anything about the event. We wanted to have the event story be more flexible and player driven, to act as something of a counterpoint to the more scripted story section of The Battle for Caldari Prime. We wanted to use social media to flesh out our event characters and allow people to obviously pick sides, though this goal ended up being put on the back burner due to time constraints. Finally, we wanted to run an event in more than one system at once to mitigate some of the participation problems that Caldari Prime ran into. Our first brainstorming session yielded some positive stuff. The basic premise was that pirates were reverse engineering and "jailbreaking“ certain new technologies (mobile structures, warp enhancement, etc), some of which made the Empires very nervous. Once the Empires found out about this, they needed to put a stop to it, particularly before a certain new faction of independent spacefarers started looking any deeper into it. They would put out a call to raise a capsuleer militia and take them to the pirates' front door to obliterate their laboratories and hopefully destroy the research contained within. We decided that to flesh it out, we would use news articles and a chronicle. From here we worked out a route, some flavorful items for the pirates to hold, some more details on the story components, and the shape that we expected the event to take (of course, this latter part is very like predicting the Icelandic weather more than 15 minutes in advance). On the day of the event we had our target systems reinforced, our developer volunteers in their pirate ships all ready to defend their precious research against untold numbers of capsuleers, and we were ready to go! We put out a news item giving those who wanted to fight for the pirates a direction to head in, both to give the actual pirate faction sympathizers a place to go, and to provide a way to get involved in the event for the criminally-minded of you who could not enter high sec. Players started flooding into the staging systems of Sarum Prime and Meves well in advance of the event, time dilation kicked in, and it quickly became clear that we needed to start moving some of the eager participants out early. The problem was, if we couldn‘t control the movement and make it more gradual, we ran the risk of running into more severe issues. We decided to reinforce Ihal and make a few broadcasts on Twitter and other social channels to direct people paying attention to these towards Ihal. This trickle effect worked well and helped deal with server load. The Empire representative actors logged in and started to interact with people, forming them up and telling them where to go. Both fleets started to move towards pirate space, though this had not been made clear to everyone in the fleets due to the covert nature of the operation. Meanwhile, pirate actors were marshaling their forces in Utopia and FD-MLJ, ready to provide a stern resistance to the Empires and their affiliates. Some of the capsuleers turned away at the entry to low security space, unwilling to risk their clones for the Empires. More baulked at the idea of entering null sec, the area of space where pirates and alliances of capsuleers rule the roost. The force led by the Gallente and Minmatar jumped into Syndicate and the target system was announced – 8V-SJJ. They reached their target and began fighting the Vindicators of the Serpentis Corporation, who were backed up by their motley crew of capsuleers from FD-MLJ, among others. They succeeded in taking down the Vindicator forces, but were unable to destroy the mining outpost-turned-laboratory before the Daredevil getaway crew of the pirates managed to salvage the last materials there and set detonation charges to ruin any chance the Empires had of gathering any evidence. The pirate support fleet made short work of the remnants of the Empire affiliated capsuleers. 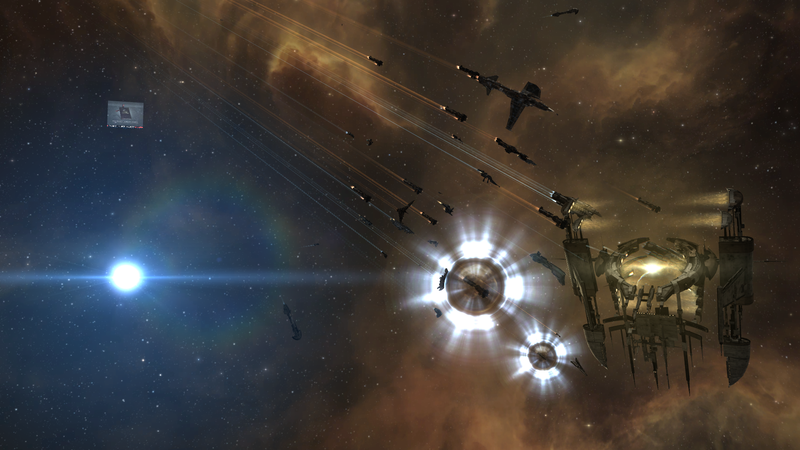 The Amarr-Caldari mustered-militias from Sarum Prime and Ihal had a tougher time ahead of them. Beset by time dilation and infiltrated by rogue intelligence gatherers from capsuleer alliances, they progressed along their route through low sec, oblivious to what lay in store just a few jumps along the route. With a ready supply of intelligence from the fleet, several alliances had set up a wall of warp interdiction bubbles inside the gate that led to Doril. Word of this got back to the Empire forces and they sat outside the gate, pondering the possible fate of those who had joined them. In the end, the need to destroy their pirate laboratory target was too great and they ordered the fleet to jump into the gate camp. Though this spelled certain death for a portion of their fleet, they hoped to get enough people through to reach their final destination and stop the pirates research. They failed. The coordinated forces of the interdicting capsuleers were able to pick off much of the fleet, though the Empire representatives did manage to get through Doril alive and muster what remained of their army. They reached their destination RMOC-W, but again were thwarted at the hands of the defenders who, as their counterparts in 8V-SJJ had done, gathered their materials, set their detonation charges, and fled. In the aftermath, battle raged on. Pirate Dramiels and Daredevils sought their escape, many meeting their end on the journey, and their mysterious cargoes of Blue Boxes were lost to the pirates (though the purpose of the box is not yet known). Now you‘re up to speed with what happened, we would like to address some frequently asked questions surrounding events in general, and some on the event last week. That being said, we know you will have many more questions and the team will be on hand to answer them in the comments thread. It‘s alright to be negative, but please remember to keep your feedback constructive. Q. What was the expected outcome of yesterday's event? Was more than one result considered? Did things go to plan? A. While there was an outcome that we anticipated; we wanted to leave the event as open ended as possible. We expected the Empire forces to successfully destroy the structure, interdict the pirate frigates who were trying to salvage what they could, and "win", so to speak. The actual outcome was different - the pirates won and got away with their research, and although the destruction of the structure was inevitable, the story impact of the actual outcome takes things off in a different direction than we had initially expected, which is cool! Q. There has been talk in the past of better tools for live event teams. Is there any progress on this? A. While the development priorities of the EVE project have not resulted in development of tools to improve the facilitation of live events at this time, the team has come up with some ideas to mitigate some of the limitations that the client and environment lend to the running of events. For instance, actor-driven storyline exposition may be contained to moderated chat channels in future so that players can follow the thread of the event without confusion developing through local chat. Ultimately, the old adage “a bad workman blames his tools” rings true once again, and working with the tools we do have to be as varied and flexible as possible in our events is the primary focus of the team. We learn more each time! Q. High player interest is great, but causes Time Dilation bottlenecks. Can you foresee a way to deliver a more optimal live event experience? A. We always strive to engage people and the participation figures at our larger events show that they aren’t just a niche experience. Balancing this with ensuring adequate server performance is tricky. We can control the size of events by controlling the information flow, but that creates the problem of having to be constantly up to date with what is happening where. For the larger events we use more large scale advertising, and this obviously pays off as we can see from the participation in this event and the Caldari Prime event, but this doesn’t always pair up well with ensuring a consistent experience for everyone and while there is an ongoing internal effort to improve cluster performance, it also forces us to be a little creative in our staging of events. We don’t have the magic recipe yet, but we’re getting better at engaging more people and we learn lessons on how to optimize the experience with every event. Different types of events can also be used to engage many people without causing undue load, for instance the Sanctuary Image Contest that we ran earlier this year, though these come with their own costs too. Q. Are concerns about favoritism a barrier to running smaller, more specific events? A. Favoritism is something we are extremely conscious of in the events team. We both seek to provide interactive content shaped by the players to add flavor to the EVE Universe, and to get involved where we can to enrich player created content. Obviously we can’t be at every event we are requested to be, so guidelines and rules have to exist to ensure we aren’t giving certain groups more attention than others. It is important for us to remember that the squeaky wheel shouldn’t always get the grease – just because there are particularly active or interested parties doesn’t mean they inherently deserve more of our time and attention than parties that are quieter but just as interested, or curious but not the type to ask for our help/time/participation. It’s also important to make sure we don’t show up where we aren’t wanted, hence our reluctance to run events in player owned null sec space, or wormholes (though there are plenty of logistical reasons in there too). Q. Is it considered a pre-requisite to be conversant with large fleet doctrine in order to enjoy live events? A. Absolutely not! While this event in particular had a focus on large fleets, and getting into null sec is obviously going to result in some fleet warfare, there are and have been plenty of event possibilities that would need no fleets at all, or small gangs, or can be interacted with solo. For the larger events, it is likely that they will trend toward being in fleets, but not necessarily utilizing the strict doctrines you see at high level play. One lesson we have learned through this event is that we should keep our actors out of fleets. While this is a concession to immersion for some people, it is also deemed necessary to ensure as level a playing field as possible. Therefore it is important for us to develop other ways than a fleet to keep people informed and able to participate. That being said, there are always plenty of player run fleets at events and many of these are well managed and openly joinable. Q. Are there plans to host live events for those who enjoy different playstyles? A. Experimenting with new things is definitely something that we are very interested in as a group. As outlined above, this event ticked a few boxes for us, but there are many more left un-ticked! We have an idea for an arc that has resource gathering mechanics in it to put our more industrial inclined players to the test, but we don’t have a timeframe for running it so I won’t go into more details at this time. A. This refers to us asking players via Twitter and other social communication platforms to move from Sarum Prime to Ihal. At the time, Sarum Prime had over 1000 players in it and was spiking heavy time dilation. Asking people to move using in game channels would have caused a mass move of players and that could have had impact on the health of the cluster. The safest approach to ensure a trickle rather than a flood of players was to use channels that would only reach certain amounts of players at once. For all intents and purposes, this worked well. That said, it would have been unnecessary if we had reinforced the staging systems correctly, which was an organizational mistake on my part. Q. Why was Doril on the route despite it being a staging location for an ongoing war? A. We wanted to get into Curse with minimal jumps to our target systems, and going through Derelik was the best way to do that. The other ingress to Curse that doesn’t involve going through player owned space is the Great Wildlands, which would have added a very large number of jumps to the route as well as making us stage from Gallente or Minmatar space for both events. We did not thoroughly research each system on the route, so we were unaware that Doril was a staging system until it was past the point of being able to do anything about it. That said, activity fluctuates and it’s reasonable to expect the space we want to use for events to also be getting used for other purposes, so whether these considerations should even be a part of event planning is a subject up for discussion. Q. Movement and fleet coordination quickly became a problem. What would you do in future to mitigate these issues? A. On the movement side, we would like to try using titans to bridge people to an event destination. That's certainly something we could see being very advantageous as well as giving people a chance to do something and see something they normally wouldn't in their usual gameplay. We did discuss that, during the event, there were problems with people falling behind due to being in different ships, or having to wait to jump through gates. This is regrettable and definitely not something we would like to happen again as it has many knock-on effects to the enjoyment of the event. The fact that some people left on time and still missed the event is something we are really sorry for, but sadly there was nothing we could do once the event had started. In terms of fleet coordination, it is likely now that we will move to an entirely player-driven fleet system, so this would be out of our hands. We will look into providing good intel channels for those who need to strategize at a high level. Ultimately, there are many people better suited than us to run these fleets and there were several examples of this on the day. To those who stepped up and ran great fleets, well done and we thank you. Q. Why were the routes so long? A. So that we had routes to collect more people on, and that felt like they came from the heartland of the empire. Also the longer travel time gives us exposition time for the story and casual RP while travelling tends to make the time go quicker. Unfortunately we did not account for time dilation in this calculation and they ended up being too long. This is something we will improve on in future. Q. Will there be more wrap-up/post-action blogs like this for future events? A. Yes. During the retrospective following this event the team identified that one thing we want to do is to have a wrap-up blog that catches people up with the whole story of an arc. That way if you only dip in and out, or if you aren't familiar at all with what goes on with events/story, you will have one place to go to access that information. Right now info tends to be scattered in a few different places and this is something we want to change. We are also looking into having an introductory dev blog prior to large scale events that catches people up with the story so far and gives them clear instructions on how to participate in the event, as that was clearly lacking here.